Wellington Mk VR3298 flew test flights up to 30,000 ft altitude, which proved sufficient to bring to light some unexpected problems with outside temperatures of –40C. At that temperature and height the flying controls and trimmer circuits became virtually unmovable. Special hydraulic fluid had to be developed to permit operation of rear turret and the bomb doors at that extreme temperature. Icing up of pilot’s dome canopy was a problem and this was overcome by drying the air, the crew suffering considerable discomfort. Then came Wellington VI attaining aprox 38,000 ft. and further trouble manifested themselves. This had a 12 foot extension to wing span and reached 40,000 ft with outside temperature being –67C. Sixty-seven high altitude Wellingtons VI were produced and in 1943, sixty of these were scrapped at a maintenance unit. No information provided other than it's a Matchbox kit with a Unicraft conversion set. 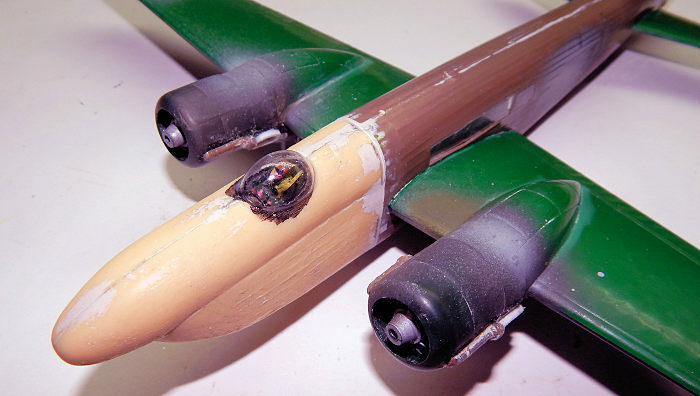 The kit modification involves a Matchbox Wellington bomber kit with the forward part of fuselage removed which is then replaced by a resin completely configured new nose adopted to house a single seat fighter type dome canopy supplied by Unicraft from Ukraine. Although differed from the bomber version no engines came with the resin set and Hercules XI engines that replaced the kit engines (Matchbox kit engines were smaller in diameter and length) came from a Sunderland radial engines which fitted exactly the size required. The triangular shaped fuselage side windows were blanked and longer ones cut further forward instead. The Mk V retained the same wingspan and tail turret. Two sets of turbo super chargers were scratch built and added to engine sides. These were of different shape to the kit ones and built to conform to shape of ones shown on side view drawing provided. The bulbous canopy was offset to port and an instrument panel, control wheel and crew seat and figure was added. The fuel jettison system and discharge pipes that were under wings were also removed for the Mk V version. It was difficult to obtain photos of the type and one could contend to make the prototype in dark earth and dark green camouflage that had yellow undersides. All decals came from my spares. A number of rectangular windows were added to top of nose at front of the pilot dome and a further two added to sides at nose extension while two more windows added to rear of fuselage close to wing positions. The geodetic structure that show through the long fuselage windows were made from white decal strip sections. Two round camera ports appear at nose front. As it happens a favourite section are the reconnaissance version of different types the Mk V fall in this category and needless to say I was anxious to built this version of the Wellington. A rather simple alteration and once the parts are available then it is within the ability of the average modeler to build this kit conversion.